An attractive belt buckle by French artist Piel Freres (1855-1925) was one highlight of the Egyptian Sale which took place on Friday 12 October at McTear’s. Featured at lot 1805, the gilt and white metal belt buckle is formed of bicolour spread swan swings and features a central blue scarab. Freres is an artist much admired for his brilliant belt buckles, and in fact, a similar buckle features in the Virginia Museum of Fine Arts in the United States. This lovely brooch sold for an impressive £190. 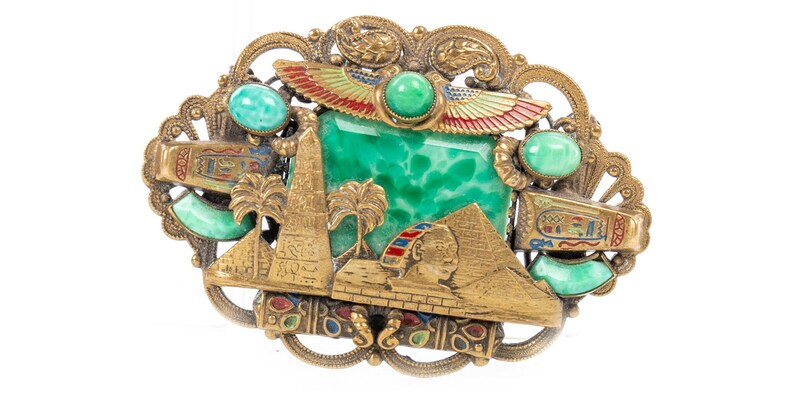 Egyptian Revival style jewels certainly made an impression, catching the eyes of bidders online and in the auction room. 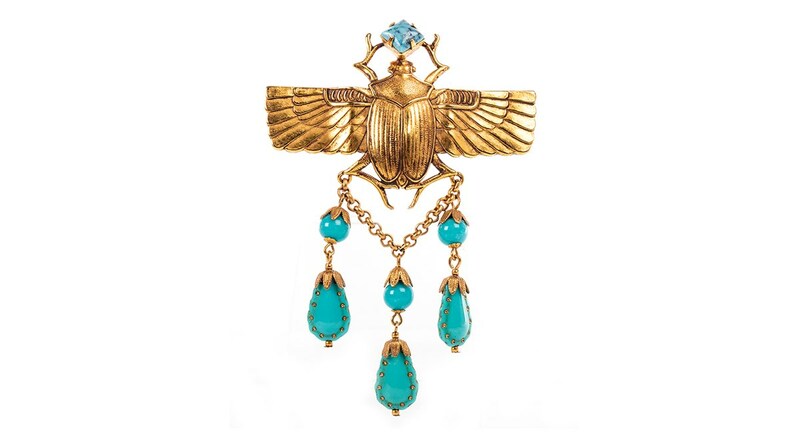 One fine example was lot 1801, a charming Askew of London pressed gilt metal scarab brooch with delicate drop detail. This achieved a hammer price of £110. Another gorgeous brooch was a gilt metal jadeite glass and enamel example (lot 1810). This piece was certainly a celebration of all things Egyptian, decorated with an array of Egyptian motifs including pyramids, sphinx, palm trees and wing scarabs. The brooch is most probably the work of Max Neiger of Gablonz, one of a pair of brothers known for creative costume jewellery in the Czech Republic in the 1920s. This brooch sold for £140 when it went under the hammer on Friday morning.